Moguls 2-6-0 offered about 50% more traction effort than a 4-4-0 and were originally used as freight engines. As trains got heavier they went into lighter passenger and yard service. They were last built around 1929. 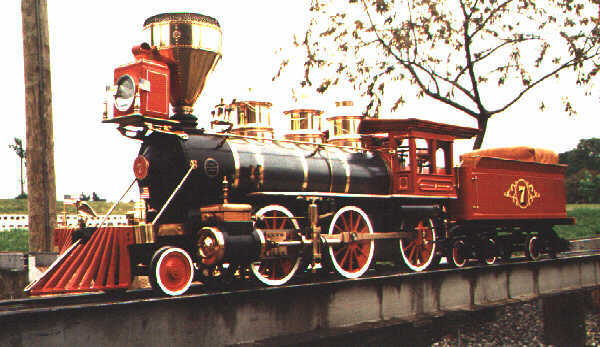 Length of Engine: 49 1/2"
Length of Tender:  34 1/4"
Cylinder Bore and Stroke: 1 5/8" X 3"
boiler is copper 6 1/8" dia. If kit Manufacture:  Railroad Supply Corp.
Cylinder Bore and Stroke: 2 1/8" X 3"
some more modern (1920) small logging company locomotives. Cylinder Bore and Stroke: 2" X 3 1/4"